There are various barbecue shops/corners available around every locality, but the experience of grilling yourself is priceless. Moreover, you can go there for once or twice, but going there every time will cost you a lot. Fortunately, you can enjoy the same sizzling, hot, and freshly grilled food at your own home just by having a lovely and best George Foreman grill. These George Foreman grills allow you to enjoy smoky flavored food with all the comforts at your kitchen counter. With the help of these grills, you can sizzle salmon, sear steaks, grill chicken, and can prepare other interesting things as well. These George Foreman grills offer a variety of advantages to its users like it will reduce the meal-preparation time and also the cleanup time as well. These grills also come with a variety of sizes that makes it a perfect option for a single user or the entire family. 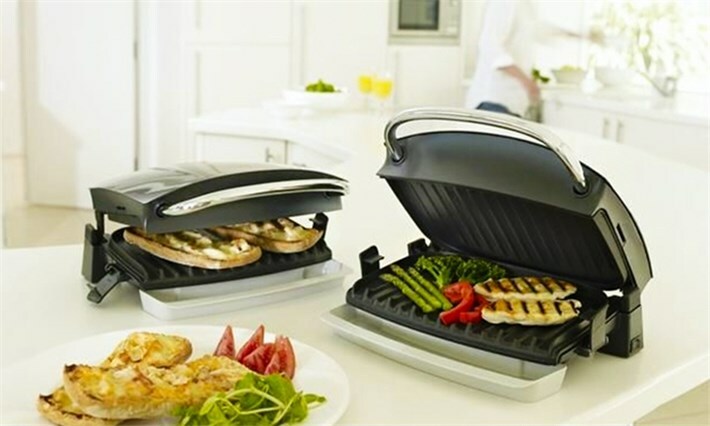 In this article, we'll be looking at all the best George Foreman grill models available in 2019. So if you're also interested in buying one for your home, then make sure to check out these grills. This George Foreman GFO201R is one of the best grill available that offers easy assembly and simplicity. So if you're planning to buy this device, then you don't need to worry as it is easy to set up. It would take just 30 minutes to assemble all the parts, while all you'll be required will be a Phillips head screwdriver. Talking about initial impressions, once you'll unbox the unit, you'll find a grill with high quality and unique design. Also, this model is compatible to be used indoor and outdoor as well, so it is a versatile model that allows you the freedom to cook anywhere. The model is elegantly designed with the cooking surface being sloped, that allows the fat to drip into a collection tray (called drip tray) when you're cooking. This simply means your food would contain almost half of the fat, making it healthier and safe. You can even set searing temperatures with this grill meaning, and your food will be full of moisture and taste. This model does a great job, and you'll feel glad after owning it. Even though it has some flaws, but considering the price tag, you'll be not disappointed by its performance. Looking into specs, this model weighs 15.05 pounds and comes with the dimensions of 9.1 x 24 x 12.1 inches. Overall, it will be a good choice for buyers. Suitable for both indoor as well as for outdoor usage. Easy to use and also simple to assemble. Great features for the asking price. You might feel the stand a little lighter. It does not have any thermostat. 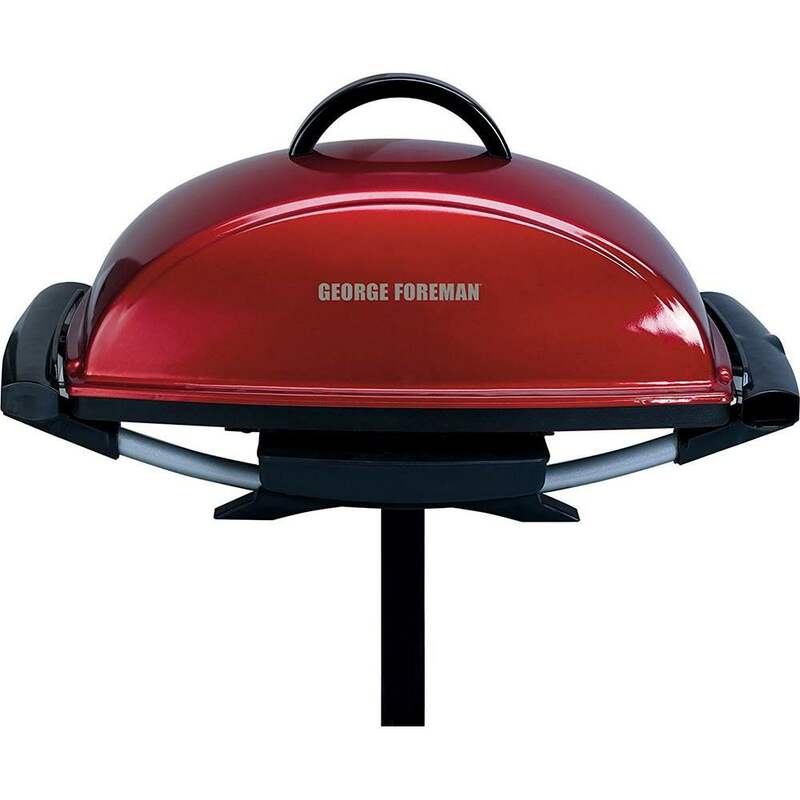 This George Foreman 15-Serving GGR50B is one of the best selling electric grill available in the market. This model offers convenience with lots of features and functions. Whether you talk about build quality or setup process, everything is top class for this unit. 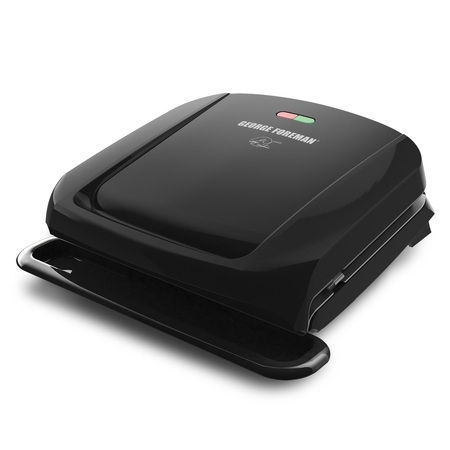 This George Foreman GGR50B comes with removable plates, a domed lid(with an adjustable vent), a greased tray, a stand and power cord with temperature control feature. The stand of the grill is made of plastic and aluminum while stabilizing legs are clipped together, so you don't have to assemble them. However, the stand is removable that allows you to take it at your kitchen counter-top within no time. After removing the stand, the model gets more compact which can be kept or stored wherever. This means that the grill is very portable, you can use the model at outdoors and at indoors as well. 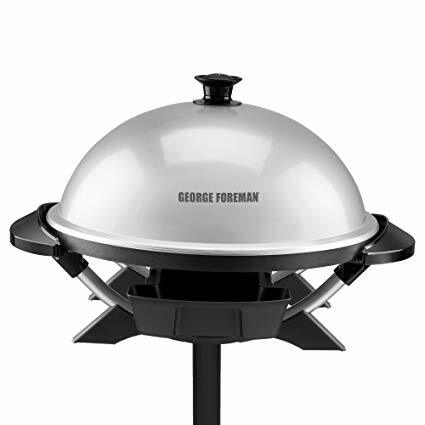 The grill plate of the model has a non-stick coating, which is known as the George Tough Coating. The grill appears to be of sturdy and solid construction. It can also be used indoor and also outdoor. It is one of the easiest to clean grill. You've to clean the drip pan regularly. Stability is an issue when placed in windy weather or at uneven floor. This George Foreman GRP4842MB Multi-Plate Evolve Grill will not only fulfill your basic needs but will also let you perform deep-dish bake and even cook muffins. This model is on the top list because of its affordability, convenience, and easy to use features. This grill has a uniquely elegant design which is constructed with the help of high-quality metals and plastics. The grill also has a digital control panel. While talking about cooking plates, it has a solid structure, but it's not that heavy. Being lighter, you can easily attach/detach it. Also, you don't have to spend much time while assembling the components. One thing which we like the most about this model is apart from grilling, and you can use it for cooking different types of foods as well. The interchangeable plates of this model let you perform this action. While the standard grill is also good and is slanted such that the fat drips get collected into the dripping tray. This feature is a savior for all those people who prefer a low-fat diet. You'll be cooking with less amount of fat without losing any moisture of the food. The deep dish tray of this model allows you to cook bread, pizza, and vegetables. All you've to do is to keep the stuff onto the tray. The cooking plates of the grill are coated with ceramic. Also, they are removable and dishwasher safe, this means you don't have to struggle while performing its cleaning. Looking into specs, this model weighs only 16 pounds and measures 11 x 16.2 x 14.1 inches. The design of the model looks sturdy and solid. The grilling surfaces and the grilling inserts are dishwasher safe. Grilling plates are made of ceramic. It also includes a digital control panel. You've to regularly oil the grilling plates. If the contains gets overflow, you've to struggle a lot for cleaning. This George Foreman GRP90WGR is another great model that comes with removable plates. The model might look a little smaller, but it offers huge versatility to the users. With this George Foreman grill, you get a total of five removable plates, two of them are grill plates, two are waffle plates, and one is griddle. You don't have to buy additional accessories for this model, as every important accessory comes with the main unit. With this variety of plates, you can cook waffles, steak, paninis, and other things as well. One problem that strikes every mind for any electric grill is the cleaning. However, this model can be easily cleaned as it comes with detachable plates, which are also dishwasher safe. The grilling plates are covered with a non-stick coating which will be requiring less amount of oil and butter for cooking food. However, you need to be little careful while cleaning these plates such that you don't harm the non-stick coating. One feature which we like the most about this model is the temperature control option that gives you good control over your cooking process. It is marked as ‘1’, ‘2’, and ‘3’ which are meant to be of low, medium and high levels. Looking at specifications, this unit weighs 11.02 pounds and comes with the dimensions of 14 x 13 x 17 inches. Overall, it's a good choice for buyers. You get a temperature control feature. 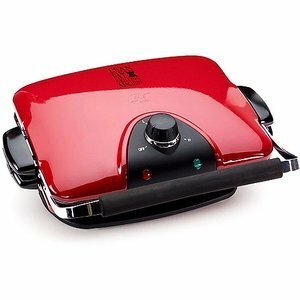 It comes with three different plates, allowing you to grill, bake, or make waffles. The grilling plates are removable and dishwasher safe. The pattern of top grill plate is quite different, so difficult to clean. This GRP4800R 5-Serving Multi-Plate model is one of the most premium grill manufactured by the company. This model is pretty similar to the GRP4842MB model which we discussed earlier the article. It also has a digital control panel and comes with some more advanced features. Additionally, it also includes an adjustable hinge. This single grill model allows you to cook four different types of food that include grilling, panini press, bake dish, and also a muffin pan which means the unit will add a new spark at your kitchen counter. The overall size of the grill is good, and you can use it for serving up to 5 people at once. All the plates included with this model are coated with nonstick ceramic material, which is also removable. You can easily detach them as per your convenience, or to clean them. This grill also includes a removable drip tray; its purpose is to collect all the fats and oil without making any mess. As we said, this grill has a digital control panel from where you can easily control the temperature and have a look at that. It also includes a timer, offering convenience to the users. This model comes with a 3-year limited warranty, which is impressive. Looking into specs, this unit weighs 16.15 pounds and measures to be of 8.5 x 15 x 13.5 inches. 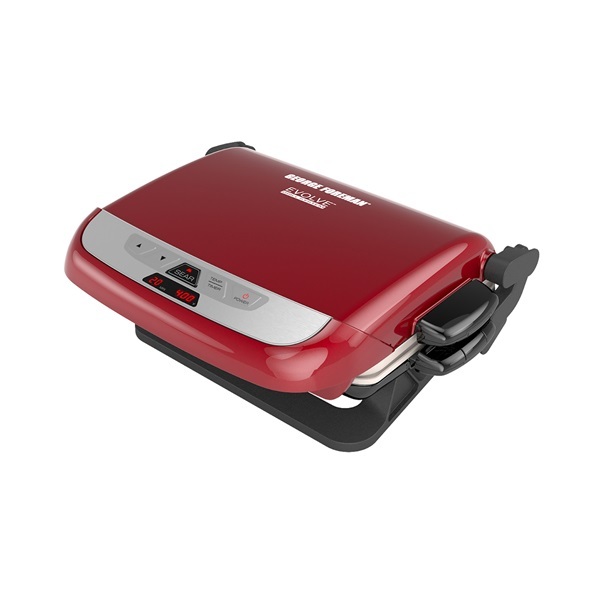 Overall, it is one of the best George foreman grill models as well. The built-in broiler feature cooks perfectly. The digital temperature control lets you set the temperature from 325˚- 450˚. It may be little expensive option for some buyers. 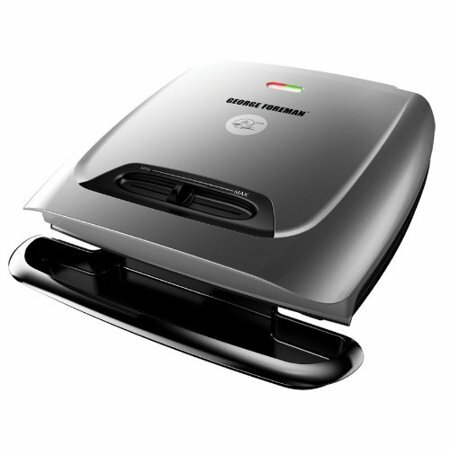 This George Foreman GRP1060B is small, lightweight, and tabletop grill model which can be used to cook for about four servings. This makes pretty clear that it is not a model which can be used for parties or family gatherings. Now if you're thinking that being smaller in size, it must not be that powerful, then you're wrong. However, the build, as well as the materials used for making grilling plates, are of good quality. These plates are removable, and you can easily remove them for cleaning purposes. Moreover, these are also dishwasher safe that means you'll not have to hassle while cleaning them. The plates are made of non-stick coating which needs a minimum amount of oil or butter (in fact, no oil and butter) to cook food. Another advantage of the non-stick coating is, you can clean them just by wiping with tissues. This George Foreman grill is quite different from other models as it heats up 35% faster which cooks your food about 10 minutes prior. It is an 1150 watt grill that has a 60 square inches grill surface. This rating of voltage is quite high for such a small and compact sized grill. Looking at specs, this model weighs 9.9 ounces and comes with the dimensions of 13.4 x 12.2 x 6.5 inches. Overall, it is a great choice for all those buyers looking for a small compact sized affordable grill. The grilling plates are dishwasher safe. It does not take much time to get heat up. It doesn't feature any temperature control option. The length of the power cord might be shorter for some buyers. If you're looking to spend less amount of time on cooking, then this George Foreman GR2121P is purely made for you. This model has an indicator light which tells you that the food is being cooked. This means you don't have to separately look the device for knowing the status of food. One of the biggest advantages of this grill is the large grilling area, which is of 120 square inches. With this large cooking space, you can cook meals for about eight people at one time. Like all other George Foreman grill, this model also comes with a drip tray that collects fats and oil there. This also offers convenience while cleaning the unit and removes about 42% of fat from your food. Moreover, the grilling plates are non-stick coated which needs simple wiping by a wet cloth. Another good thing is its dual cooking system, which can be enabled by attaching the kickstand on the back and by elevating the plates. This model also has a temperature control feature which allows you to adjust the heat range from low to high. This means you can cook meals according to your taste and mood. Looking at specifications, this model weighs only 7.1 pounds and measures 13.2 x 4.2 x 14 inches. Overall, it’s a great compact sized grill available for the buyers. This grill is compact and light in weight. It has temperature control feature which allows you to set the heat range. The plates non-removable, so you'll have to struggle for cleaning them. Grills are one of the best things to have for your kitchen or yard. You can enjoy smoky flavored, juicy, and grilled food daily at your home. With time, grills have become even affordable and most importantly have been reduced into compact sizes. Now you don't have to think much for buying a grill. But with such a large list of option, it is really hard to tell that which one model is perfect for your kitchen. We’ve arranged top and best George Foreman grill models in 2019. We've reviewed all the models in great detail and also have mentioned their pros and cons. However, we'll not declare one model as a clear model as we're unaware of the buyer's needs and requirements. So it is upon you to identify out your needs and then look for an appropriate model out of these. Hopefully, we've helped you find the best George Foreman grill for you.